Bella, who originally came from the Dominican Republic, was adopted by a woman who found her on Craig's list. She feared for her safety so she went to get her right away. She wanted to keep her but she worked long hours and didn't think it was fair to leave her alone so long. Bella is a real cutie and loves to be petted. She gets along well with the other dogs in her foster home and rides nicely in the car. She also enjoys going on walks. Upon taking Bella to the vet we found out she has an enlarged heart. She will need to be on medication which is common for a senior dog. Bella needs a true rescue angel to give her all the love she deserves so she knows that there is goodness in the world. Bella is fostered in Harrisburg, PA and her adoption fee is $150. If you are approved contact Helena: 717-264-9799 or yorkierescueme@gmail.com. 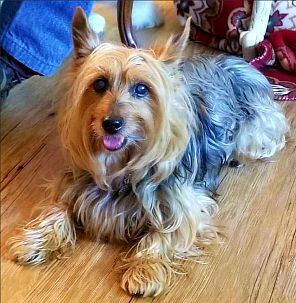 Chewy’s owner just went into assisted living and was so upset that he couldn’t take his little buddy with him. We promised that we’d find him a wonderful home. 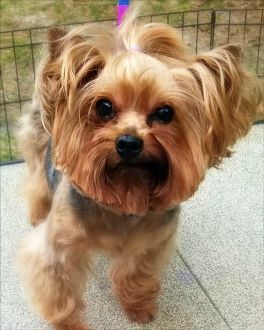 Chewy is an easy-going and loyal little guy. He loves to go for leash walks and is a true cuddle bug. He will sleep curled up with you in bed all night. He just wants to be wherever you are. He is fine as an only dog but he does get along well with the other dogs in his foster home. If you already have dogs he would do well with another dog that's either his size or larger. Chewy is neutered and up-to-date on all day of his vaccinations. He is fostered in Boyertown, PA and his adoption fee is $250. 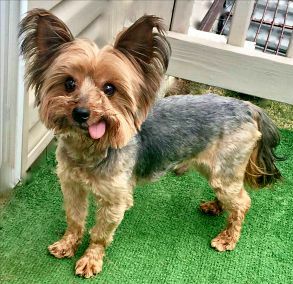 If you are approved contact Vicki: 717-264-9799 or yorkierescueme@gmail.com. Dixie is a sweet little girl who has left her breeding days behind her. When she first arrived she had a bladder infection with blood in her urine. We took her to the vet and found what they believe is a tumor in her bladder. They gave her medicine, and within 48 hours she was feeling much better. But that’s just a temporary fix to help her not be so uncomfortable. The infection is going away but the tumor is still there. We need to take her to the University of Pennsylvania for an ultrasound. Once we know more we will share it with everyone. In the meantime her vet bills are starting to add up. If you are able to make a donation it would help a lot. Please keep Dixie in your thoughts as we do everything we can for her. We will keep everyone updated on how Dixie is doing. If you are approved contact Jen: 717-264-9799 or yorkierescueme@gmail.com. Georgie was a breeder dog, but those days are long gone. He has such a sweet disposition and he loves to follow his foster Mom around. He's observing the other dogs in his foster home to see what they do. This kind of activity is new to him. Another dog in his new home will prove to be a good role model and help him learn how to live the wonderful life every dog should know. Georgie has been neutered, has had a dental, is up-to-date on all vaccinations and has had his bloodwork done. All he needs is a loving new home where he can run and play and make up for lost time! Georgie's adoption fee is $450. He and his cute little tongue are fostered in Harrisburg, PA. If you are approved contact Helena: 717-264-9799 or yorkierescueme@gmail.com. 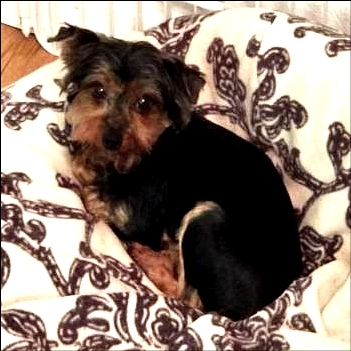 Mizaki is a sweet little Yorkie girl who finds herself in rescue through no fault of her own. Her owner got a promotion at work and her new hours would have her out of the house 12-16 hours. As sad as she was to surrender Mizaki she knew it was the right thing to do for her. Mizaki has tons of puppy energy! She loves to play and must go to a home with another dog - preferably a male over 15 pounds. Her new home must also have a fenced-in back yard. Mizaki will be between 6-7 pounds when she's full grown. She has been spayed, is up-to-date on all her vaccinations and has had her blood work done. 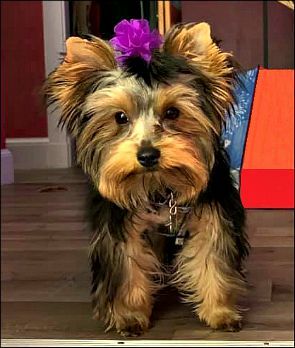 Mizaki is fostered in Danbury, CT and her adoption fee is $850 If you are approved contact Grace: 717-264-9799 or yorkierescueme@gmail.com.